It was one of those deep sleeps that is rare for me these days. I awoke not quite knowing where I was. Moving my eyes from side to side, I sat up. The ambient noise of a Monday morning told me that the rest of the world was already doing its thing. That meant that I had to get up. Planting my feet upon the floor, my grogginess slowly gave way to a nagging, low-level grumpiness. After grumbling at the cats and tripping over more than one of them, I decided, on my way to the kitchen, to ignore my resolution to give up coffee. I made a large pot of French press—extra strong. Avoiding yet another darting feline, I made my way down to the studio. The coffee didn't work. I just stared straight ahead not knowing where to start. I needed a change of scenery. I grabbed the Nikon and took off down the street towards the old rail path. A good, long walk might shake off my crankiness before it might taint the entire week ahead of me. These days suburbia is louder than the city. The usual army of leaf blowers was already out in force as were about five construction crews. A UPS truck rushed by me, it's diesel engine clanking and sputtering. A hundred kids, already bored with summer, were screeching at one another in the park. Even the Canada geese were in on the conspiracy, honking and fighting with one another for lawn territory on the baseball field. I picked up the pace, needing to find a quiet place for my camera and me. I figured the Larkspur Palms would do the trick. A row of tall and regal palm trees, I've been photographing them for years. They are at the dead end of a quiet street, near a peaceful church. They ever inspire me as I slowly make a photo collection of them, trying to photograph them at different times of day, light, and weather. It's always quiet there and I felt myself getting enthused with the anticipation. I picked up the pace again. On the way I skidded to a stop. The rail path was closed ahead—by another construction crew. I shook my head and took the detour. A quarter mile ahead was another crew. This one, consisting of three guys, was whacking away at some tall fennel that had invaded the path. They seemed annoyed that I interrupted their gas-powered whacking so I went past them as fast as I could. The second guy snarled at me as I said hello to him. Maybe he just didn't hear me over the din of his whacker. I finally made it to the palm trees. They stood tall against the morning fog which was already burning off—revealing a deep blue sky. My heart lightened as I pranced around them, trying to find the perfect perspective for today's light and mood. I fiddled with exposure, fussed with focus, and spun around until I got dizzy. The day started to make sense. Suddenly an enormous, RV that was parked nearby began to roar to life. A guy with a baseball cap was revving its engine to a fever pitch. The roar was deafening as a blue cloud of smoke drifted towards the palms and me. It got louder and louder and louder with with each passing moment. I sighed as I looked up and then put my lens cap back on to protect the glass from the exhaust. The moment was over, the short, giddy spell had been broken. In an instant I was back on the path, heading towards home. 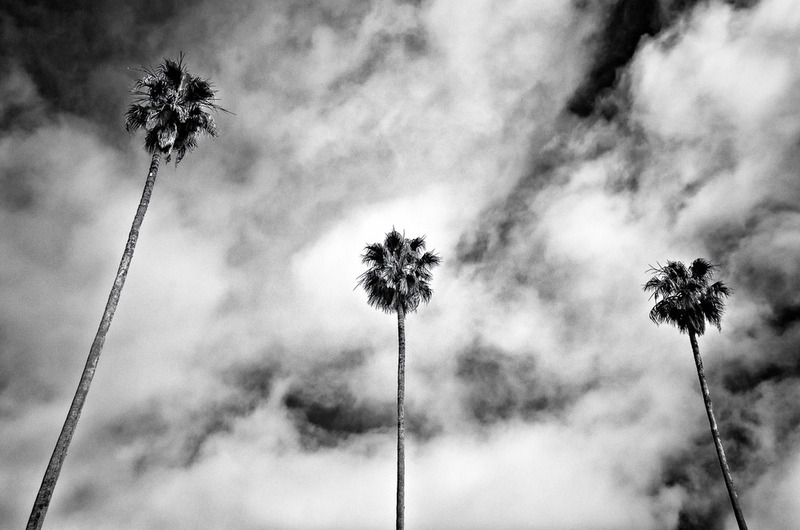 I was looking forward to inspecting my new images, hoping for some new additions to the Larkspur Palm series. I eyed the RV and the guy with the baseball cap as I passed by, wondering how suburbia got to be so noisy.